I decided to have another play with the emboss resist technique onto the Newsprint DSP, this time using the gorgeous Stampin' Up! Medallion background. I am so glad this made it into the New Stampin' Up! 2010/2011 Idea Book and Catalogue. The greeting is from Stampin' Up! Fresh Cuts stamp set. I clear embossed the image onto the Newsprint DSP and then brayered the Raspberry Tart ink over the top several times to give good coverage (I like the way a teeny bit shows through though). I then distressed the edges and mounted that onto the Kraft background which had been stamped with the sanded background using Sahara Sand ink. I also included another layer of distressed DSP between the Raspberry layer and Kraft card. I hope you enjoyed today's card. I'm loving my creating at the moment, and will have some more things to upload in the next day or so, so make sure you pop back here soon, or better still subscribe to my blog in your reader. Just look for the little orange guy in the top right hand column. You can also join my newsletter for some exclusive monthly samples! The Stampin' Up! For You stamp is a great one to colour with markers to pick out special words you want to highlight. I've used tempting Turquoise and Chocolate Chip Stampin' Write Markers. I've used the 1 1/4" circle punch to cut that out, matted it onto a 1 3/8" punched Chocolate Chip circle and then popped that up with foam dots above the For You stamp which is stamped in Riding Hood Red. The stem and leaves were hand cut (next time I think I'll sponge the edges for more definition). Oh and look - some crimping, lol. Love my crimper at the moment. Happy Thursday my dear stamping friends. Hope yours is full of love, laughter and happiness. Great New Discounts on the Last Chance List! 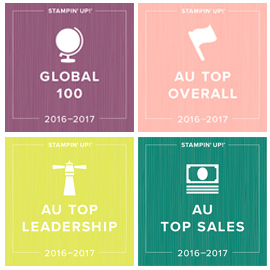 Wowsers, I nearly fell off my chair when I logged into the Stampin' Up! Australia Demonstrator website this morning and saw they had taken 50% off a heap of punches and added more great discounts to the Last Chance List. One week only (until 11.50pm August 31st, or until sold out). Check out this and all the other details on my Last Chance Page. I'll be keeping this post up top until 31st August now, so scroll down for my latest cards. I'm here to take orders right now - just call on 03 9735 2946 or email. Hubby is away this week at TechEd on the Gold Coast, so it's easy dinners and stamping as soon as the kids are in bed this week! Feeling so inspired to stamp and create and share. Think it's the new Stampin' Up! 2010/2011 Idea Book and Catalogue. I know I keep saying it, but you are going to LOVE it. It's just so inspiring - new colour, new products, new samples. So today's card is for Just Add Ink 31 - a colour challenge to use Real Red, Chocolate Chip and Kraft. I've used a new stamp set Friends Never Fade and the new Newsprint DSP. I've used the emboss resist technique with brayering over the DSP. I like how a little bit of it shows through still. The rest is pretty staright forward. Greeting from Stampin' Up! Occasional Greetings. Kraft layer is crimped (loving crimping at the moment - I am crimping anything that's not tied down, lol). Hope you have a crafty week too. Be back soon with some more creations! 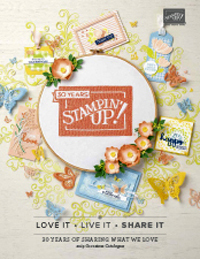 Here's another peek of some of the lovely products to come in the new Stampin' Up! 2010/2011 Idea Book and Catalogue (details about how to get yours here). This one is a lovely new set called Friends Never Fade, used with Greenhouse Gala DSP. Isn't it lovely? I'm getting so excited as we move closer to the new catalogue start on 1st September. Stampin' Up! have really outdone themselves, I tell you! So many gorgeous things and I've been madly stamping away to be able to bring you lots of new samples here on my blog from September 1st. I think I came home with 9 new sets as gifts and prizes from Convention, not counting what I have preordered). 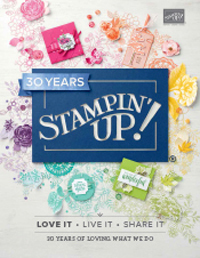 Love being a Stampin' Up! 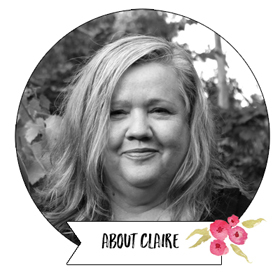 Demonstrator and being able to share my love of stamping with you through my blog! Make sure you subscribe to my newsletter (top right hand column), so you don't miss a thing! Demonstrators are very welcome to subscribe to my blog newsletter as well. Unfortunately, we have come across some red tape with the Lara Fundraiser and the use of the PayPal Donate button. So instead of paying the $10 to buy my CD via the donate button, I'll need you to be directly invoiced via PayPal (or you can also pay via direct deposit). I will then collect that in my PayPal account and manually donate it to Lara's family, along with a list of people who supported Lara by buying my CD. For those that were able to pay via the PayPal button before it was removed, please be assured that was all OK and your funds have gone to the right place. I have the CDs ready to pop in the post this week. For anyone else if you would like to get 40 of my tutorials for $10 and help a fabulous family, you can read all about it on this page. I have updated my Last Chance page tonight, with details of what's currently sold out and what's getting low. I am placing orders the day they come in, so if you want your order to go straight through and have your products sent straight to you from the warehouse as quickly as possible, give me a call on 03 9735 2946 or email me. I have another sample for you here though! This card was started in the middle of one of the Just Add Ink challenges, but didn't get finished until it was too late. I love how it turned out though, so wanted to share it with you. It's a bit hard to see from the photo, but the entire card is crimped and I LOVE how that looks. you must try it! The colours inspired by the Just Add Ink team were Always Artichoke, Rose Red and Kraft. Everything is Stampin' Up! except for the ribbon which was lurking in my rather large ribbon stash! I'll be back soon with some more stamping, and all the latest Stampin' Up! news. Until then, hugs from me. Thanks also to everyone for their messages of support over losing Monty. Your love and support means a lot.